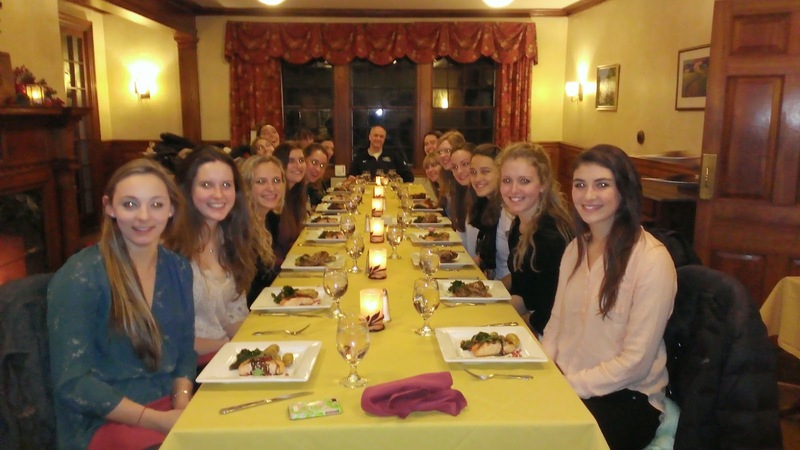 We celebrated our Season with a final dinner at the Swift House Inn last night. What a lovely place, and we want a special THANK YOU to go out to the Underbrinks and the Kolodkas for sponsoring this lovely event. We'd never have a dinner like that without you, so we all really appreciate your generosity and thoughtfulness. In a fashion typical of our team, we don't do a big, formal banquet celebration with speeches and presentations, but instead, just get together for a wonderful meal, and laughs and enjoy each other's company. Pat Manley, our Faculty Affiliate, and Judd Mackey, our trainer joined us as they're both very important members of our team as well as the players and coaches. We do have a few team awards that the team votes on, old-school Varsity Letters for the freshmen, and the official MIDD Certificate of Participation for everyone, so we hand those out so everyone has a token of appreciation for their efforts during the season. I think Lizzy mentioned that she actually put her varsity M on a quilt or blanket, which is a great idea. Then, I thank the captains for their special contributions. I always recognize our seniors for FOUR wonderful years. Every year I get them a navy fleece blanket with Middlebury and their # on it so as they cuddle up on their couch next year in whatever part of the country they end up in, they can reminisce about the "good ole days" playing MCVB! It's a pretty quick award presentation, but hopefully a special one nonetheless. The captains and team gave the "adults" a cool mug with the team picture on it, and some fun food items for Meg, in addition to a very special Picture Book for the coaches of a snapshot of the season, and a CD of the warm-up music. THANK YOU for those nice gifts!! Spirit Award: Kathryn Haderlein (and Cowie)! Congratulations to everyone, and thank you for a wonderful Season! !